…The White Dragon, it is said that the Legendary Hero Redan used a White Dragon as his Monstie, what kind of Monster it was? No one knows; but the legend is very clear that this creature was key on Redan´s mission. After that shot of information, Lute goes to search for information on the City and Lilia does the same at the Scrivener´s library. Meanwhile, Cheval and the other Riders are going their own way chasing the Blighted Monsters; Dr. Manelger keeps insisting on the offering for Cheval to join them; but he is sharp in telling them No. Meanwhile Lute, he is searching for clues and decides to ask people who know the world, ergo the Hunters! Suddenly Debli comes and he tells them that if it´s info what they want then… They should go and ask his Master! 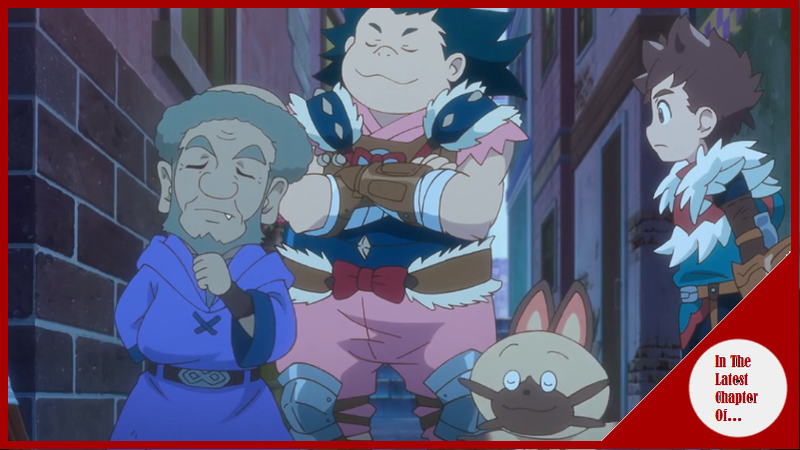 Navirou is suspicious since Debli is always up to no good; but that stops when they get to know that Debli´s Master is descendant of a Legendary Hero, what was his name? Whatever, in any case his Master´s name is Nedan! …Meanwhile Lilia is investigating at the Scriveners Library until Simone appears and has some news to her, that the Guild Master has a request for them… To search for the White Dragon, Sadly the knowledge they need it is not on this Library, which means they have to go out on a team, Simone will be the Captain and will accompany her, Pappa the Liutenant and her favorite Disciple Lilia! …Back with Lute the story has ended and man what an amazing story was! So amazing that might as well never be told again! In any case, Nedan might know where to find a White Dragon´s egg; but he will need some money, like 10,000 zenny. Lute was willing to give it to him; but Navirou told him to just give him the half and the other when the mission is successful, like when one does a quest! And so… Lute gaves him the money and Nedan tells them to come the next day. Meanwhile Cheval and his group are fighting a Blighted Tigrex! The fight is intense; but after a Kinship attack they defeat the Monster! Mille and Hyoro comes close and…Nope. The thing is still alive, The fight continues until they make sure that the Monster is completely and surely dead. After the fight, Mille and Hyoro are tired and hungry, but Cheval wants to keep going until the night falls… Both Riders look at their leader with concerned eyes. At the next day, Lute goes where Debli and Nedan are, Nedan shows his Zamtrios Hunting Horn. The Hunting Horn, a weapon that works similar like the hammer; but with the ability that with every attack the air is recollected in a part of it´s body making a new musical note, so when the Hunter blows it a song will be heard; these songs have different uses for the user and the Hunters nearby like healing, curing poison, augmenting attack or defense and so forth. In any case it is the time for the group to go and search for the White Dragon Egg! While the group goes on their journey, Nedan tells to the other members (Lute, Navirou and Debli) to pick every bit of herbs, fungi, insects…Well all the collectaton that one ca find on these hunting grounds. Finally the group reaches a cave where it is supposedly the White Dragon egg is, it is an egg as white as the snow so one can recognize it easily, Nedar compliments Navirou (since he was afraid of entering such scary cave) and Lute´s Palico gives him a donut for his sweet words. The group goes inside and Nedan quickly throws a flash bomb that reveals a Nerscylla! The monster starts going for Debli, who runs with all his might, Lute calls for Laeus; but he is so far away that it might take a while for him to come here! Nedan for his part starts swinging his horn preparing a super powered song! (Basically he is doing nothing). Finally Lute´s Rathalos has come and with some fire balls the Nerscylla gets chased away. A Khezu?! This ain´t a white Dragon! Navirou checks the egg and discovers that the whiteness was a fake! That old man Nedan cheated them! The group goes towards him! Nedan was running with all he has; but Laeus Flying is way faster than him so Lute and Navirou catches him with no time! Nedan confess and says that finding a White Dragon can be hard, and certainly it is not on a one-day trip! He also says that he found a Khezu egg, grabbed it, painted it and left him on a Nerscylla´s cave. Navirou demands for a Refund! Nedan then says that he is in a bit of monetary problems, so much that he sold his Zamtrios Flute; so he used the 5,000 zenny to get it back. Still, Nedan promises to give the money back after he does some quests…Most likely. <<<He soars Gallantly across the heavens astride a Dragon White.>>> those words have passed on his family since generations, and those words plus the fact that no one knows what “White Dragon” means then, it just tell us that this Monster lives in a far away place, one where no man lives. Lute asks if he is Redan descendant? Nedan says that he is. Navirou then ask why is he so poor and running a Junk shop? Nedan says that being Redan´s descendant means nothing if you aren´t a Rider…So such fact it is as valuable as a rock. Now, Lute has made his mind and will left this White Dragon business on the side for the time being, so he is going to the Volcano now! Navirou and Lute rides Laeus and fly towards it! Debli starts running behind the since he is going to accompany them! On the air, Lute says that even if that old man cheated them, he went for a Khezu egg, painted it and put it on a Nerscylla´s nest…So in truth Nedan must be a good hunter. Nedan, for his part goes back to Gildegaran and will start hunting now! An enjoyable chapter;, it was slow; but it served for the foundation of this new Story Arc, now on the Volcano, we get to know still a little more about the story of Redan and his Monstie; but as we can see that might be a mission for Lilia instead of Lute! At the same time we sought how Cheval is going on a self-destruct quest by searching and killing the Blighted Monsters, it surely will end biting him in the arse, especially if something where to happen to Hyoro or Mille, Which seems likely, on the same note it seems that both Riders can see that Cheval is in that self destruction journey that will only end with his death. Finally, I can´t wait to see Lute´s adventure on the Volcano and what he, Navirou and Debli will have to deal in there! Oh also the only White Dragon that I remember is the White Fatalis, the original Dragon.